We know you were just screaming, "But what about blue??" 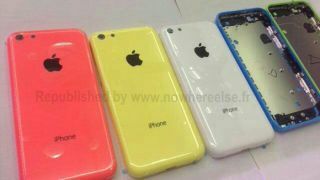 when leaked photos showing alleged green, yellow and red cheap iPhone models appeared earlier this week. Calm down, as now comes word (or sight) that Apple may be planning to have a blue budget iPhone join the low-cost trio, as the latest snap from a Chinese factory seem to indicate. What appears to be a half-assembled iPhone blue shell has been photographed alongside the three previously leaked of colors and a white version, according to French site Nowhere Else. With the pigments popping up left and right, we wouldn't be surprised if we soon see a fuchsia, burnt orange and taupe model soon. The colors making you dizzy? Take three blips and call us in the morning.